Travel And Tour World – You are also responsible for culture and heritage department so what was your main focus before this post? Heather Humphreys: I was responsible for cultural engagement here. Therefore, right across the country we had our 2016 commemoration and that event was to commemorate a 100 years since the events that led to a formation of independent Republic of Ireland. This was an expression via arts and culture examining our period in history closely. We have a very strong cultural awakening that we have in this country, as we are renowned storytellers and everyone knows a little bit of Irish culture. And, of course we also have Yeats and strong literary traditions in our country. We also had a program called ‘Creative Ireland’. The purpose of that event was culture and creativity as the centre of every community and we get people engaged with local groups and encourage them to participate in our culture. Engagement in culture is the most important thing. So we also developed another program for children to realize creative potential of every child in Ireland that would ensure every child that goes to primary school is imparted creative skills in whatever form whether it is singing, dancing, drama or even coding. And thirdly we want the government to invest in art and culture centre in our country and cultural institutions, museums, libraries, theatres, concert halls and national ones in Dublin, so we are embarking on a capital plan to invest in these facilities so people have spaces where they can come and perform. Also we have particular interest in film industry here and animation and we have a wonderful array of storytellers that produce these films, as well as a number of companies that have been nominated for Oscars. We also encourage film companies across the world to come to Ireland and recently we have had the Star Wars and first and second Star Wars have been shot in some locales in Ireland. Travel And Tour World: India is also big on film industry and our Bollywood star Priyanka Chopra is currently in Dublin for shooting TV series Quantico and many Indians are looking to sign MoU and we often look for innovative destinations. Heather Humphreys: Yes we do have some very interesting destinations and sure we can capitalize on Ms. Chopra. We have a large number of studios that are developing in Dublin and people wish to come to different parts of Ireland to shoot scenes out of the studio and I am sure there are good opportunities here. Travel And Tour World: Tell me something about your visa processing. Acquiring Irish visas is very difficult for Indians as compared to the UK. What about other parts of Europe – do they need a visa when they come to Ireland with a Schengen country? Heather Humphreys: You come to European Union and you can enter Ireland. There must be some processes pertaining to it and we can find out that. Travel And Tour World: We have a large number of tourists who come to London who come to Ireland and Scotland, so how you see you have any corporation with them to promote this destination? Heather Humphreys: They are quite anxious, but I am not sure if there are any arrangements there. No, we do not have any combined program to promote tourism. Travel And Tour World: How do you see Ireland as a destination for MICE tourism? How strong you are in organizing trade shows? 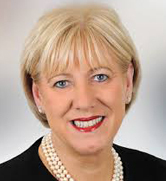 Heather Humphreys:We are very strong particularly in the bigger urban areas for instance we have wonderful convention centres in Dublin and we have many events with lot of accommodation in different areas there are big centres like one in Limerick Cork and Galway and there are many ones here and we can host big events and Dublin is most popular in this aspect. Travel And Tour World: In terms of inbound tourism who are the main markets within EU and what about Chinese market? Heather Humphreys:Chinese market is increasing and we continue to do more trade with China and that will increase tourism within Ireland as well. Travel And Tour World: Any special program for FDI or tax relaxation for new companies in special economic zones? Heather Humphreys: In terms of FDI our agency is IDA (International Development Association). And we do not give incentives for Dublin but if you want to locate outside of Dublin we can provide support there. In terms of indigenous Irish industries we are working very closely and supporting them in improving their processes. We have lean programs and we also support them in market diversification and you know we can have trade relations abroad and we have support for outside Dublin. We focus on regional development and we have launched recently launched program to support industries in the regions. Travel And Tour World:Do you have the database of manpower, the database of talent because when new companies are set up, for instance a peak project needing manpower? Heather Humphreys: We do have a very highly skilled workforce here and we would have central statistics office would have that type of task what we trying to do is cluster talent in Galway. For instance there is a very strong med-tech sector so you find companies are clustering more and more and in Limerick you have the pharma sector. Therefore you have a lot of people coming to this place and up here is engineering so we are developing here we could be an engineering cluster and centre of excellence. We also have a lot of collaborations with the universities so they are producing the right type of graduates to meet the skills that businesses require. Travel And Tour World: Do you have any statistics about high skilled labour for immigrant and citizens? Heather Humphreys: We do have a very high percentage of Irish people who go for the third level education we also have the youngest population in terms of 40% of our population that is under the age of 29. So all is fine for investment and for companies that want to come here and apart from all that, especially because we are in the EU, and companies are able to avail a huge population of 500 million in terms of sourcing the skillsets. But if there are particular skills you need you can apply for a visa system. Travel And Tour World: How strict is your visa law for immigrant with a working visa? Heather Humphreys: To get a working visa we have to show there is a need here for that particular skillset. However, we cannot give you all the details right now. I look after support business in terms of labour and skills shortages and we do allow people to come here to work and fill in need in the labour shortage in certain areas. We have reduced our unemployment level in 2012 at almost 16% we have now reduced down to 6% and we are looking at 5.8% for this year and further reduce to 5.3% in 2019. We will soon have full employment. Travel And Tour World: What is your view on Brexit? Heather Humphreys: Well of course Brexit presents challenges but nevertheless we are working very closely as members of the EU and we are very committed members of the but it is going to take some work as there are some challenges. But still we got to work our way through it. Because England is our closest trading partner and there are billions of euros across between these two countries in trade every week it is huge. But having said that, there exist opportunities for companies who want to have their European headquarters in Ireland, in UK they have European headquarters and they may want to locate out of the UK and we consider Ireland a very suitable location in terms of the language, the way we do business, and common laws and regulations so we are strong and transparent and also have political stability here also we have access 500 million people in the EU market. Travel And Tour World: Ireland is beneficiary to Brexit in one way? Heather Humphreys: We do have many challenges so we do have that we are very close to the border with Northern Ireland here we want to make sure we do not have a hard border here we want as close as possible trading relationship with the UK and we want our best to achieve those goals so it will take some time. We have a big meeting in June that will help us take decisions in November. We have to finalize the agreement by November and then the UK can have a transition and then decide whether we will have a transition or a gradual withdrawal. Travel And Tour World: What about the scene in Ireland in terms of new startups? Heather Humphreys: We support startup companies very strongly through our government agency Enterprise Ireland so there is a big focus on new entrepreneurs in supporting them we have local enterprise offices that start to help them at the start and we have many different programs that support companies to scale off and also to grow the markets and to export and grow their global markets so there is a very strong support there for the indigenous Irish industries. Travel And Tour World: How friendly is Government to help a new company who is trying to set up business from outside Ireland? Heather Humphreys: This country we want to do business and our policies are very pro-business in terms of company coming to set up business in Ireland. The idea is the agency that will guide them through who to work with and put them in charge with the various different agencies and so there is a lot of support there and we continue to work with international companies who want to work here and come here we are very welcoming to such companies and create employment.